Our fall bus trip has just ended and it was a great success. We left early Wednesday morning, November 16. Sue Irving always treats us to a morning rest stop break, including donuts, coffee and juice. We arrived about 11:30 at the Allen County Public Library. This is a high energy time as we rush off to the second floor to find our tables, seats and electrical outlets. We spend the day happily finding books, reading, working on our computers, talking to each other and taking short breaks to clear our heads. Some of us take a dinner break and head out to O’Donnell’s Irish pub while others opt for a pizza party at the hotel, later that evening. Day two, November 17, starts with breakfast at the hotel, climbing on the bus again and back to the library to pick up where we left off. Our time comes to an end at 6pm. We load up and head toward Auburn for dinner at the restaurant of our choice. Then we load up one last time and head back Michigan. Some of us have gotten some new information, new names to consider, new places to check out and some new knowledge of how to search at ACPL next time. As a side note. 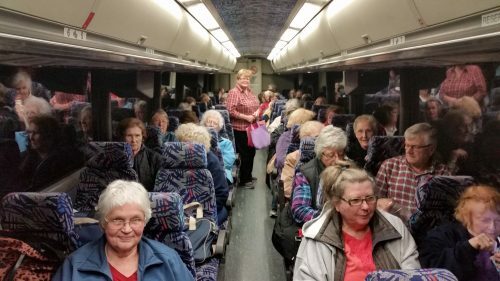 Every bus trip introduces some new activity, event or memorable moment that unites the group with a story that is recounted on every bus trip that follows. This TIME our 7am wakeup calls came between 5 and 5:38am. In my next post – personal thoughts from some of the Bus Trip attendees. #1 | Written by Laurel about 2 years ago. #2 | Written by Verna Hough about 2 years ago. Had a lovely time. Enjoyed meeting everyone. I found a couple of goodies can’t wait for next year to see what else I can learn. #3 | Written by Ruth Waybrant about 2 years ago. Sorry I missed this one – but NOT sorry I missed the very early wakeup call.